Begin by speaking to Sir Ceril Carnillean in the southwest corner of Ardougne. First off, speak with Sir Ceril Carnillean, located in a mansion in the southwest corner of East Ardougne. 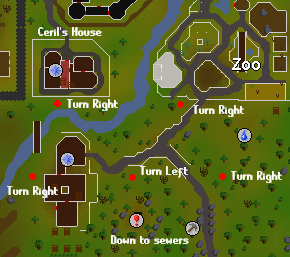 The mansion is a short distance west of the Ardougne Zoo. Ceril says that cultists keep breaking into his house and they have stolen his family armor. Now head south over the bridge behind the mansion, and enter the cave just east of the Clocktower. Speak to Clivet and ask him what he means about the Carnilleans. Now you must choose to recover the armor for Ceril, or side with the evil cult and revive Hazeel. The action you take here will make a (very minor and perhaps inconsequential) influence on future quests. When you speak to Clivet, refuse to help him with his plans. He will board the raft and leave, but before you can follow after him you need to redirect the water. Go back to Ceril and speak to him, and then you'll need to turn each of the valves, as indicated on the map to the right. If you don't turn the valves correctly, you'll end up somewhere elsewhere than the hideout. Now go back inside of the cave and board the raft. Head south and speak with Alomone (level 13). He is the leader of the cult ,and he says that the butler is part of their group. Attack him and once he is dead, he should drop the Carnillean Armor! Bring this back to Ceril and tell him about the butler, but he won't believe you. Go upstairs and speak with him again, but he still doesn't believe you that Butler Jones is a Hazeel member. He will then give you 5gp as a "reward." Search the Cupboard in Jones' room to find some poison and an Mark of Hazeel, which proves to Ceril about it. You'll then receive your reward! When you speak to Clivet, agree to help him. He will give you some poison, and he says that you need to kill someone from the Carnillean family. Head back to the mansion and go downstairs. Use your poison on the stew that the cook is cooking. Go back upstairs and speak to Ceril of Philippe to find out that someone (you) has killed their dog. Go back to Clivet, tell him the good news, and he will give you the Mark of Hazeel. Wear the mark, leave the mansion and then turn the valves as indicated above. Don't forget, you'll end up somewhere else if you turn the levers the wrong way. Go back into the cave and take the raft. Speak to Alomone, who now needs a scroll the resurrect Hazeel! Go back to the mansion and talk to the butler (while wearing the mark). Now go downstairs and search the crates for a key. Go back upstairs and knock on the butler's wall to find a secret passage leading to a ladder heading up. Use the key on the chest to find a Scroll to resurrect Hazeel. Go back to Alomone who will now start the ritual... and he will appear! Hazeel is level 296, and non-attackable. 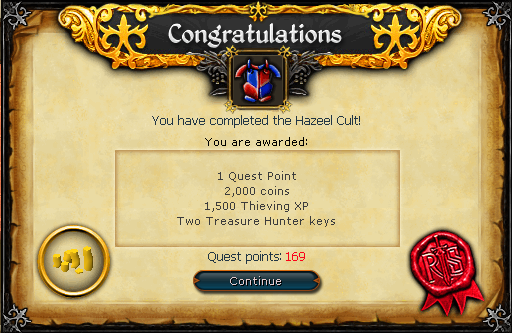 Quest complete, and you'll receive your reward!